The European Azerbaijan School had a double celebration on 15 September. In the East, the pomegranate has been considered the king of fruits from the earliest of times. The 19th century was a time of progress and enlightenment in Azerbaijan. 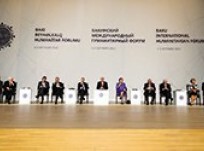 This year saw the 2nd European Film Festival in Baku. There is a picturesque place in northern-central part of Azerbaijan called Basqal. Footballing history was made in Azerbaijan between 22 September and 13 October 2012.